Open circles reveal a lacy mesh motif in a scintillating earrings design. 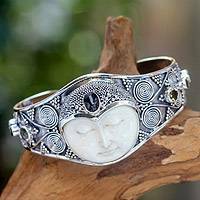 Exquisitely handcrafted of sterling silver, the earrings come from Arunima in India. Wheels of dark lava stone are featured in this pair of Balinese dangle earrings. 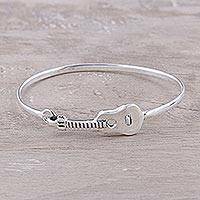 Rupadana designs the earrings to feature open holes in the center, accented with sterling silver. Ghanaian artisan Esther Narh designs these exquisite dangle earrings. Crafted from a sese wood base and wrapped in a vibrant fabric print, this pair is adorned with colorful beads and brass hooks. 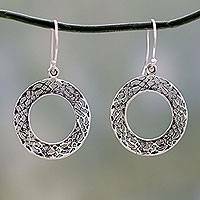 From off-set, open centers radiate freeform lines of openwork in these sterling silver circle earrings. Bhavya Jain of India designs these dangle earrings that give a feeling of energy and light. 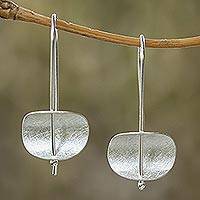 Artisan Lalana of Thailand designs these sterling silver threader earrings. 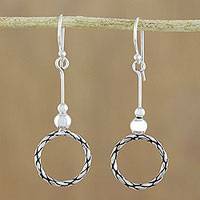 Three playful sterling silver beads swing from cascading circles in these unique earrings that are full of motion. 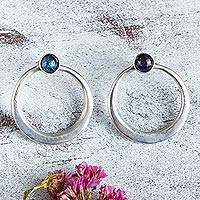 Clean vertical lines captured within eye-catching circles comprise these unique dangle earrings. By Bali's Desi Antari, this pair is crafted from sterling silver and dances from gleaming hooks.